You are here: Home › Event News › Rousey vs. Carano… APRIL FOOLS! ← Check Chuck Liddell in this Duralast commercial. EPIC! 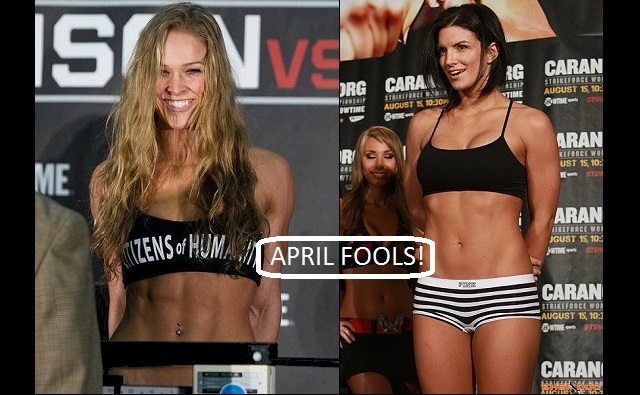 Rousey vs. Carano… APRIL FOOLS! April Fools’ confirmed. I received my Underground newsletter today which details the prank and how many people it reached, very impressive. Good job MixedMartialArts.com. For April Fools Day the UG Blog announced that Ronda Rousey and Gina Carano had signed to fight each other. On Facebook it got 2,749 Comments, 10,832 Shares, 38,818 Likes, and a reach of 2,887,680 people. It is still growing.